Motivated by the security of the nonlinear filter generator, the concept of correlation was previously extended to the conditional correlation, that studied the linear correlation of the inputs conditioned on a given (short) output pattern of some specific nonlinear function. Based on the conditional correlations, conditional correlation attacks were shown to be successful and efficient against the nonlinear filter generator. In this paper, we further generalize the concept of conditional correlations by assigning it with a different meaning, i.e. the correlation of the output of an arbitrary function conditioned on the unknown (partial) input which is uniformly distributed. Based on this generalized conditional correlation, a general statistical model is studied for dedicated key-recovery distinguishers. It is shown that the generalized conditional correlation is no smaller than the unconditional correlation. Consequently, our distinguisher improves on the traditional one (in the worst case it degrades into the traditional one). In particular, the distinguisher may be successful even if no ordinary correlation exists. As an application, a conditional correlation attack is developed and optimized against Bluetooth two-level E0. The attack is based on a recently detected flaw in the resynchronization of E0, as well as the investigation of conditional correlations in the Finite State Machine (FSM) governing the keystream output of E0. 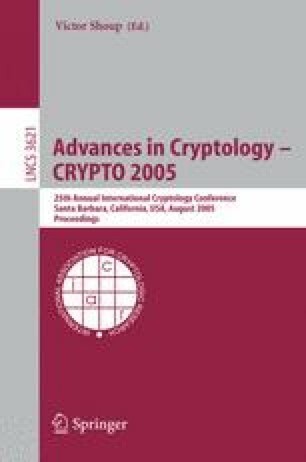 Our best attack finds the original encryption key for two-level E0 using the first 24 bits of 223.8 frames and with 238 computations. This is clearly the fastest and only practical known-plaintext attack on Bluetooth encryption compared with all existing attacks. Current experiments confirm our analysis.